Both Steadfast Ahoy and i have chosen to show you this picture in our posts today, because truly this is one of the BEST ideas we've ever seen. We'd be selfish keeping this newly learned hostess trick to ourselves. Instructions: Place a bowl inside a bowl full of water. Place in freezer until frozen solid. You may float flowers in the water if you like for extra decoration. Use as a serving dish for strawberries dipped in chocolate. YUM and oh, so pretty! 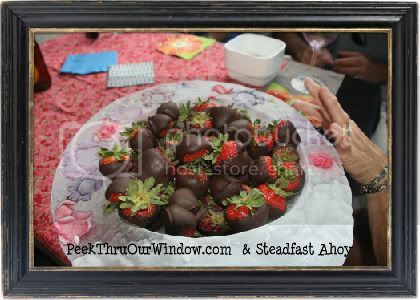 Your chocolate dipped strawberries do not melt and you have a huge conversation piece at the party!